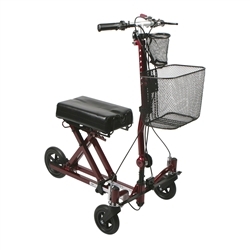 Lightweight, economical knee walker comes standard with a drink holder and single break mechanism. Universal for both left and right knee injuries. Height adjustments: Handle: 33"-41", Seat: 18"-22"
Recommended User Height: 4'10" to 6'4"
Height adjustments: Knee Rest: 17.5"-23.5", Handle Height: 33.5"-41.5"
Height adjustments: Legpad: 18.5"-21.5", Handle: 33.07"- 37.79"
Knee walkers, sometimes referred to as knee scooters, provide a convenient alternative to crutches. 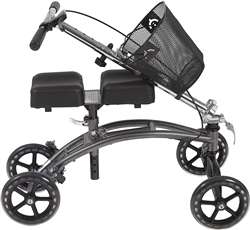 If only one leg is injured and the injury is below the knee, the knee walker will help you get around quickly both indoors and outdoors so you don’t have to limit your activity.